But never mind that. It’s still my favorite new bookmark—and not just because it comes from an interview I did. Although cliché, writing is a lonely business. Some days our confidence dips dangerously low—so low we only wish there was a wise mentor sitting in our living room, drinking coffee and cheering us on while dispensing endless inspiring advice. Should you not wish to have a stranger sitting in your living room drinking your coffee, there is an easier way: do an author interview (at their house, drinking their coffee). I did my first interview back in 2004, when I was in my MFA program, and have continued to do them whenever possible, usually when I fall in love with a book or essay I’ve read. There is a great little guide called The Art of the Author Interview, which can be a big help if you find the process a bit overwhelming (transcribing is the worst part, particularly if you’re like me and your interviews go on for two to three hours). I don’t do many rewrites. I tend to let it roil until it erupts onto the page in a torrent of words. Then I edit. I write daily when I am in this stage. When writing a longer piece, the process is slow at the beginning and picks up speed somewhere after the middle, something like the whoosh you feel after cresting the peak on a roller coaster. That’s my age-old problem. I want to write but then when I’m given the opportunity I have a hard time with it. When I was in graduate school I went to Yaddo and worked on my thesis. It was incredibly stimulating – a life-changing event. I loved being there. I still go back there because I get work done. But it comes at a huge cost. You’re isolating yourself, sitting alone in a room all day. It’s like being in a prison cell. I have gone to Yaddo before and I’ve been driving up their beautiful, tree-lined drive and started crying in dread over being trapped with myself for a month. I mean let’s face it – it ain’t that fun to write. It’s a lot of fun to have written; but it’s not that fun to write. I hardly ever know what I’m doing when I begin. And then, the research often pulls me in many new directions. You just have to trust your instinct. Very often you sit down and think, what on earth is this book about? Is this piece of it pertinent? Is it important or trivial? It’s an issue that besets every writer in every form, but perhaps the writer of memoir is more susceptible to it because memoir is so personal—you think, is this just my experience or does it have a wider significance? Even with Children of the Holocaust, I asked these questions. If you’re a serious writer, and something keeps eating at you, it’s probably eating at other people also. But it’s very hard to know. And it’s very hard to know on a bad day. It doesn’t matter if you’ve been writing for thirty years or not. You are still susceptible to the same doubts as a new writer. 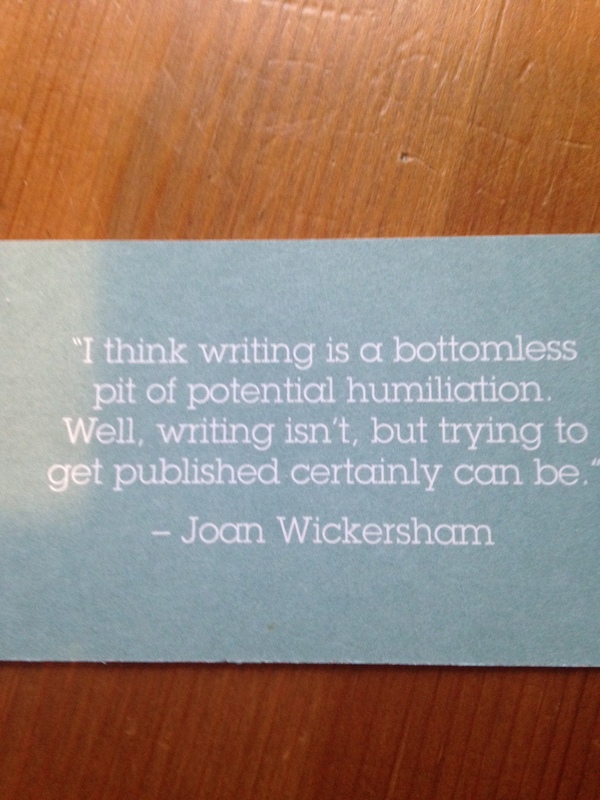 And of course, what Joan Wickersham said, about that bottomless pit of potential humiliation. All reminders that yes, we are in this together. Terrific piece–assuring and reassuring in its resonance.